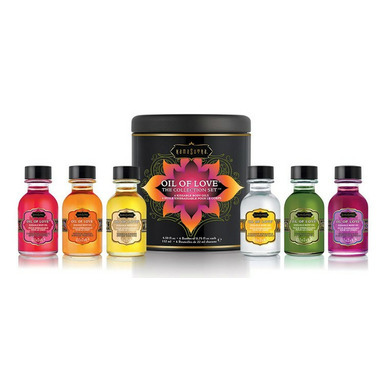 The Kama Sutra Oil Of Love Collection Set allows you to try all six flavours of Oil of Love in one limited edition value set! Mix and match the flavours using the included recipe booklet to create delicious combinations. Each kissable, water based foreplay oil gently warms on the skin. Use the included dropper to apply Oil of Love to the erogenous zones of the body. Lightly blow on the area to experience the gentle warming sensation and follow with kisses, enjoying the sweet flavour. Original: Kama Sutra’s first product. Notes of creamy vanilla, warm chocolate with a hint of spicy cinnamon. Raspberry Kiss: The tart yet sweet flavor of wild raspberry. Vanilla Cream: Creamy vanilla flavour. Reminiscent of fresh baked sugar cookies. Tropical Mango: Sweet, ripe mango. Strawberry Dreams: Plump, juicy strawberries. Kama Sutra's number one seller! Coconut Pineapple: Melt-in-your-mouth coconut cream with a splash of juicy pineapple. Directions: Apply to an erogenous zone, lightly blow on the area to experience the gentle warming sensation, then kiss (or lick!) the product off the skin. This is not a flavoured lubricant. Oil of Love is a kissable flavoured body oil designed for foreplay enhancement. Strawberry Dreams: Glycerin, Propylene Glycol, Water (Aqua/eau), Flavour (Aroma), Sucrose, Sodium Saccharin, Red 40 (CI 16035), Caramel. 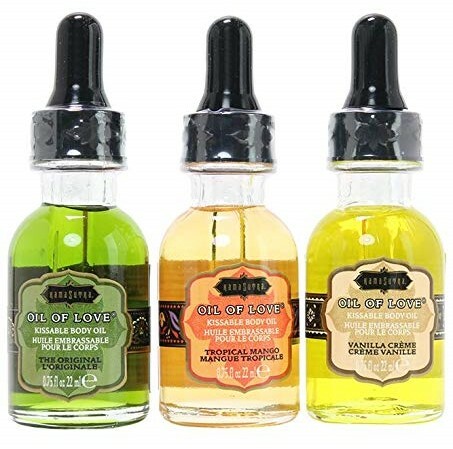 Tropical Mango: Glycerin, Propylene Glycol, Water (Aqua/eau), Sucrose, Flavour (Aroma), Sodium Saccharin, Benzyl Alcohol, Limonene, Yellow 6 (CI 15985), Red 40 (CI 16035). Vanilla Creme: Glycerin, Propylene Glycol, Water (Aqua/eau), Sucrose, Flavour (Aroma), Sodium Saccharin, Yellow 5 (CI 19140). The Orignal: Glycerin, Propylene Glycol, Water (Aqua/eau), Sucrose, Flavour (Aroma), Sodium Saccharin, Yellow 5 (CI 19140), Red 40 (CI 16035), Blue 1 (CI 42090). Coconut Pineapple: Glycerin, Propylene Glycol, Water (Aqua/eau), Sucrose, Flavour (Aroma), Sodium Saccharin. 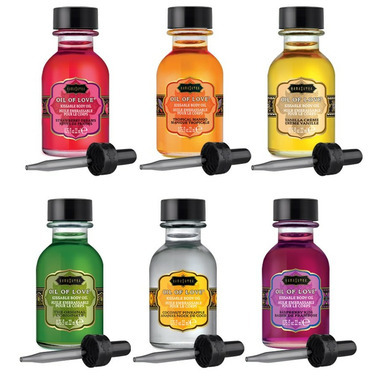 Raspberry Kiss: Glycerin, Propylene Glycol, Water (Aqua/eau), Sucrose, Flavour (Aroma), Sodium Saccharin, Red 40 (CI 16035), Blue 1 (CI 42090), Caramel.